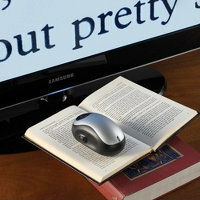 As easy to use as a computer mouse, this device scans written materials and sends them wirelessly to your television set in real time, magnifying them up to 25X for easy viewing of fine print. This is a great idea. Or, you could get a new pair of glasses.